This a cow, called Knickers, who lives in Western Australia. Knickers stands at 6ft 4inches tall, and weighs in at a whopping 220st. Knickers is what’s known as a ‘coach’ – a castrated male cow that leads other cattle in the herd. And before all you hungry carnivores say ‘I wonder how many steaks you could get from that,’ I’ve got news for you – he’s too big to be taken to the slaughterhouse, you monsters. So if you want to eat this behemoth, you’ll have to take him on with your own bare hands. And if you do, my money’s on Knickers – he’d eat you alive if he wasn’t vegetarian. Knickers’ owner, Geoff Pearson, tried to sell Knickers at auction last month (can you imagine the cost of feeding him?!). However, meat processors at the auction said they couldn’t take him as he was simply too big. 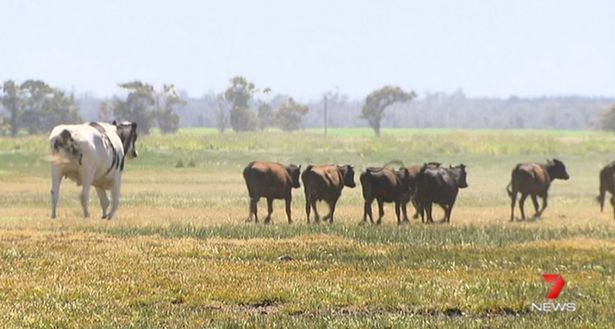 Instead, Knickers will live out his days at Geoff’s farm on Lake Preston, Myalup – around 85 miles south of Perth, as the Mirror reports. Knickers is a a Holstein Friesian breed of cow, though obviously they don’t all come as big as Knickers. He was always a standout steer from the others, a bit bigger than the rest. While Knickers’ other ‘mates’ were sadly sent to the slaughterhouse, Geoff decided the big guy ‘was a standout, so we though let’s leave him there, he’s not hurting anyone’. But after a while, Geoff soon realised Knickers hadn’t stopped growing, and eventually reached a mammoth 6ft 4inches. Knickers is apparently beloved by the other cattle on the farm, who follow him around the place. 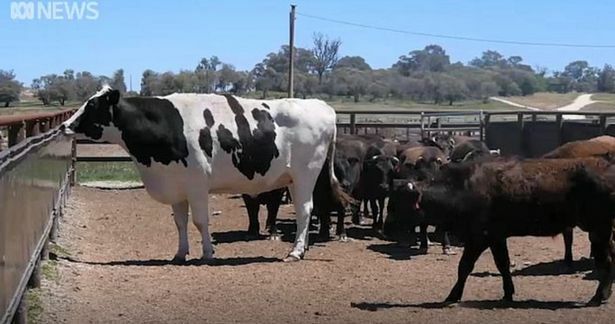 I think the Guinness Book of World Records need to get themselves down to Western Australia as, currently, they have the tallest ever cow measuring 190cm (just over 6ft 2inches). That hefty title went to a cow called Blosom, from Orangeville, Illinois. Sadly, Blosom passed away aged 13 in May, 2015 – so it seems there’s a spot open, Knickers! The funny thing about Blosom was how unaffected she was by all the attention that seemed to surround her. As long as she had her oats, and daily chin rubs and ear scratches, life was good.